On the last day of June, 41 ladies from five different golf clubs played in the South Ronaldsay Ladies Open. The competition was played in sunny and dry conditions, but the strong wind and hungry ditches made it a reduction only round. Results: Nett:1 Maggie Learmonth 71; 2 Karin Brown 72; 3 Violet Ward 74; 4 Ann Gilmour 76. Gross: 1 Shona Croy 79; 2 Eileen Spence 93; 3 Sheila Hourston 94; 4 Lynn Shearer 96. Specials: Longest Drive on the eighth: 0-20 H/C was won by Shona Croy and 21-37 H/C was won by Ann Sinclair. 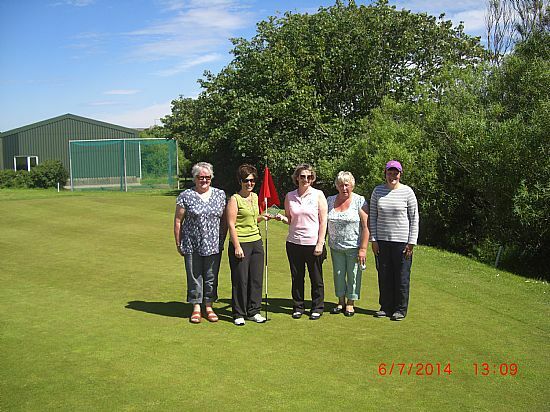 Nearest the pin on the 18th: 0-20 H/C was won by Sheila Hourston and 21-37 H/C was won by Maggie Learmonth. The nine hole putting competition was won by Linda Bonner. Thankyou to all the ladies who travelled to the sunny south to play in our open and to the men and women who helped make it a success. Thankyou to our green keeper Chris and helpers for the work on the course and for the thoughful positioning of the pins. Thankyou to Lorraine for settling out of court! G M Training and Murray Arms Hotel for their generous sponsorship, it it very much appreciated. On Sunday June 17, the Pipedream Open was played. It was a lovely,warm and sunny day,with the course in excellent condition. The specials were the longest drive on the eighth, which went to Shona Croy, and nearest the pin on the fifteenth, which Marinne Tait won. The winner of the nett trophy on 67, reducing her handicap by one to 13 was Lynn Shearer. Second nett on 74 was Violet Ward and third nett on 74 was Sheila Walls. The winner of the gross trophy with a 77 was Shona Croy, second on 90 was Sheila Hourston and third on 91 was Eileen Spence. Congratulaions to all the prize winners and thank you to Chris and helpers for all their work on the course. A huge thankyou to Andy from Pipedream Plumbing for his generous sponsorship, which is very much appreciated. On yet another tropical day down in the sunny south, the first ladies seniors open was held on Sunday 10th June. With trophies kindly donated by Lynn Shearer. The specials for the day was nearest the pin on the 6th was won by Lynn Shearer and the longest drive on the 8th went to Lorraine Work who also had a two on the 11th hole. The winner of the nett trophy with a fantastic 67 was Linda Bonner, second on 74 Violet Ward and third on 76 Kate George, the winner of the gross trophy with 83 was Lynn Shearer. The highlight of the day (and a very delighted lady) with an impressive hole in one on the 15th, winning £300 was Moira Irvine (no pressure Gents) she also won the putting competition. Congratulations and well done Moira. Thanks to all the helpers on the day and a special thankyou to Chris and his helpers for the superb condition of the course, well done lads. 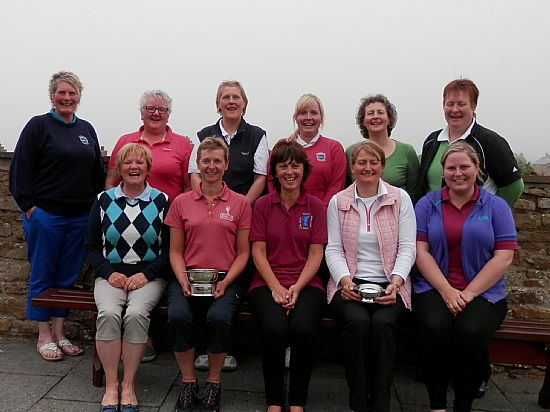 Twenty-eight ladies took part in the Robertsons Ladies Open on Sunday May 27. The ladies enjoyed the tropical conditions of the sunny south,followed by a presentation of prizes at Robertsons coffeehoose. Special prizes for nearset the pin at the ninth were won by Shona Croy and Karin Brown. Special prizes for nearest the pin on the 15th were won by Sheila Hourston and Eleanor Macdonald. Winner of the Robertsons Ladies Open with a brilliant 65 nett was Sheila Hourston, reducing her handicap by one to 15. Elizabeth Drever and Maggie Learmonth were second and third nett respectively, while in the gross section, Shona Croy took first, with Lynn Shearer in second. Congratulations to the prize winners and a huge thankyou to Robertsons coffeehoose for their generous sponsorship. Hello Ladies and welcome to 2018 summer session of golf. l would like to begin with thanking Vice-captain Violet and the ladies for their continued support of the ladies section. l would also like to thank the Greens committee and SRGC men for the support given to the ladies section. The hard work and positive team approach is very much appreciated. ln the ladies section the emphasis is very much on the enjoyment and social side of golf with a few golf trips included on our calendar. Any ladies out there who fancy trying golf, just come along on a Tuesday or Friday evening from 6.30pm onwards for the length of time that suits you, coaching and equipment will be provided. The first session will commence on Tuesday 17th April 2018. Any queries contact myself on the numbers below. Look forward to seeing you and your friends on the golf course. 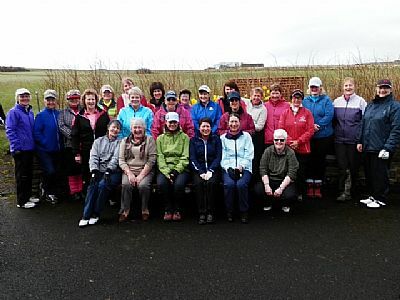 On Saturday 2nd April, 19 kirkwall ladies made their way across the barriers to the Hope course to get the lazy Hope ladies out of hibernation. The Hope girls were not to be beat,they laid on perfect weather conditions, almost tropical sunshine for the round of golf. After a most enjoyable game of golf, everyone tucked into soup,sandwiches and puddings in the club shed. A huge thanks to everyone who helped make the day most enjoyable and a special thanks to Kirkwall ladies for making the journey. On a beautiful summers evening, Fri 26th August the ladies held their annual putting competition. It was good to see two new ladies and enjoying the putting, the winner of the night was one of our new golfers of 2016 Linda Tait, 2nd Liz Pirie and 3rd Lynn Shearer. Alex Rosie presented Linda with her prize. The night was rounded off with fish and chips provided by our local chippyn Peter and Tracey Hasson washed down with some wine. Thanks to Geoff for his photography skills and hope to see Lynn and Suki back on the golf course. 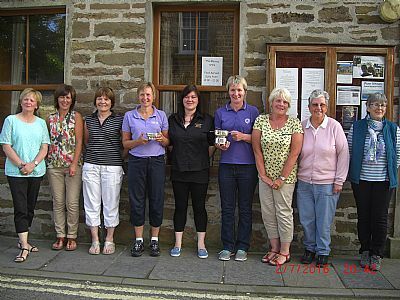 On Saturday 2nd July 2016, the South Ronaldsay ladies held their 2nd ladies open. The sun shone bright, specially ordered for the Kirkwall and Stromness ladies who travelled through to the Hope to make the numbers to 37. We almost only had 36 as our Vice Captain Lynn Shearer forgot to enter, but after much deliberation we decided to let her play. At one stage of the day l had to look twice as l thought my husband had lost quite a bit of weight, but no it was Ida Seatter (wearing a pair of bright checked trousers like his) running through the course dodging golf balls to catch Anne Spence for the keys of her car where she had left her shoes. The clubs gross trophy went to Shona Croy with a 78(5) runner up with 88(12) Lynn Slater and 3rd with 91 (13) Audrey Poke. Nearest the pin in two on the 9th 0-20 handicap Sandra Shearer and 21-36 handicap Carol Hartmann. Nearest the pin on hole 15 Barbara Foulkes. The CSS was 67. Shona Slater recorded a two on hole two and Sandra Shearer and Lynn Slater both had twos on hole 14. With all the ladies finished playing golf, they headed to the Murray Arms where they relaxed and enjoyed a delicious meal, they then dashed outside to watch the fancy dress floats before they continued with the presentation of trophys handed over by Gina. On Sunday 19th June the ladies held their annual captains prize, it was a bright blustery morning, but this did not deter the hardy women. The winner of the competition went to Sheila Hourston on nett 40, second equal on 51 Liz Pirie and Lynn Shearer and third on 52 Violet Ward. The ladies then headed to Robertsons for a superb lunch and homebakes, where they hijacked Anne to be their photographer. Thanks to everyone who attended. 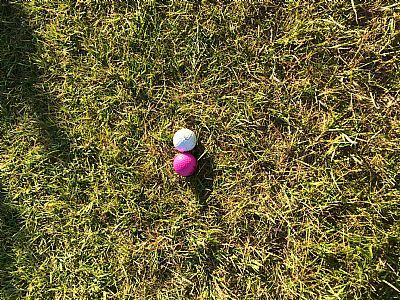 The ladies held their final fling on Saturday 10th October 2015, unfortunately the course was closed, but reopened for the ladies (because they rule). The weather was perfect, although under feet it was a bit wet for this 9 hole competition. The trophy for the final fling was designed, made and donated by Kylie Pirie. The winner of this superb trophy was Lynn Shearer with nett 39, 2nd was Liz Pirie with 48 and 3rd equall on 49 was Lyndia Birss and Violet Ward. In the non handicap section 1st Jacqueline Rosie, 2nd Betty Laird. On hole one, the longest putt was Liz Pirie (hope no one was videoing the measuring). On hole nine, nearest the pin in 2 was Violet Ward, and in 3 was Jacqueline Rosie. The ladies then headed for the Sands where they enjoyed a delicious meal and had a most enjoyable evening. I would like to thank Kylie for the trophy, Liz for the other prizes, the Sands for their hospitality and special thanks to our personal taxi driver Gary. Also to Anne and Kate who were absent on Saturday, but their donations went down a treat, thanks we had a great day. As it is the end of another season, challenging as it has been, l would like to take this opportunity and thank everyone who helped make the ladies section a success this year. Thank you all very much Violet. 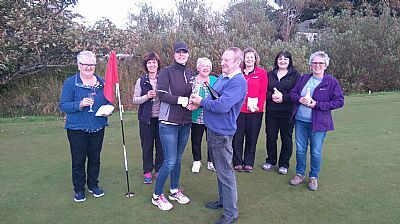 The Hup ladies held their annual putting competition on Friday 28th August, with torrential rain at 5.30pm it was debatable if this would go ahead. Yes, out came five hardy women, not sure if it was the putting or the chippy supper that brought them out, never the less they had a good night. The winner was Lynn Shearer with 45 and in joint second place both with 47 was Anne Seatter and Liz Pirie. There were three ladies with holes in one, with only one bottle of wine for the prize we throw the cork away and shared it out. Alex Rosie presented Lynn with her prize and we all enjoyed our chippy supper supplied by Peter and Tracey Hasson washed down with a glass of wine, followed with chocolates courtesy of Peter and Tracey. Thanks once again. The ladies captains prize was played on Sunday 19th July after being postponed from June, the weather was better, but still wet. This did not dampen the ladies spirits, after all the Hup lasses are getting used to wet conditions. 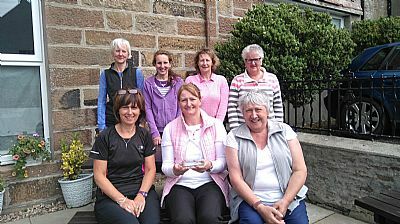 The winner of the trophy donated by the ladies captain was Yvonne Widdall, 2nd Violet Ward, 3rd Liz Pirie and 4th Jacqueline Rosie. After the presentation the ladies made their way to Hoxa Tearooms where they enjoyed a scrumptious lunch, especially the strawberry and fresh cream puffs, washed down with coffee(not wine). Joining us were ladies from Kirkwall and Stromness with 27 players entered, this dropping to 24 as the competition was postponed to Sunday due to the unusual down pour on Saturday. The weather could not have been better, no wind and the sun shone, although the course was very wet, with some muddy ladies, everyone seemed to have a good time. Christine Harcus may need to look for some L plates for her trolley after running into Shona Slater all for sake of washing her ball. The winner of the competition receiving the net trophy donated by Murray Arms was Shona Croy on a net 70(5). There were also special prizes on the 6th and 18th. Nearest the pin in one hole 6 (0-20)Shona Croy (21-36) Eleanor MacDonald. Nearest the pin in two, hole 18 (0-20) Isla Slater and in three (21-36) Liz Pirie. The ladies then retired to the Bowling Club for food and the presentation. Thanks to Christine and Shona for their kind words. The green keeping staff for the course, Gary for the computer side of the competition, Benny, Billy, Neil and Jim for all their help the day before and on the day (though Benny forgot his camera) thankfully Liz Drever had hers. A special thanks to the Bowling Club for their premises, Peter and Tracey Hasson, Jacqueline, Liz and Anne for coming to my rescue at short notice to provide the food and drinks, also to Heather and Yvonne. Not forgetting Lynn and Lynda who have been next to me over the last couple weeks helping arrange our big day. Back row:Lynn Slater, Liz Pirie, Eleanor MacDonald, Isla Slater, Lynn Shearer, Lorraine Work. On Friday 12th September, the ladies had there fun/chippy night. We began with a 18 hole putting competition, this being won by Lynn Shearer with 45 followed by Liz, Lynda,Lorna and Violet with 51. There were 2 holes in one by Lynn and 1 from Betty Budge,well done as Betty has just begun playing. We all returned indoors as we were being eaten alive by midges. Alex Rosie having donated a trophy for the competition then presented it to Lynn. We then tucked into a superb chippy supper supplied by Peter and Tracey Hasson, followed by some hilarious antics. Good night was had by all. The ladies captains prize was played on Sunday 6th July. Better weather could not be had as the sun cream was lashed on. This was the first time this ladies competition has taken place at SRGC. It was a close run competition with only 3 strokes separating the joint 2nd place and the winner, Lynn Shearer with joint second going to Liz Pirie and Violet Ward. The presentation took place on the almost tropical 9th green. The presentation was followed by an excellent meal at the Hoxa tea rooms. This event was very much enjoyed by all who took part and all the ladies now look forward to their next event.